Coca Cola Argentina produced a sizzling advertisement for Sprite Zero with ‘Bikini’, 45 seconds of sexually teasing humour. Italian model Estefania Pigazzi appears on a beach in Argentina, driving the local guys crazy. The Sprite Zero Bikini commercial was developed at Ogilvy Argentina, Buenos Aires, by Gabriel Vásquez and Gustavo Taretto, creative directors Lucas Panizza and Hernán Ibarra, editor Joaquín Espagnol, art director Ignacio Ferioli and agency producer Julia Novio. Filming was shot by director Claudio Prestia via Bendercine, Buenos Aires, with producers Jacqueline Lijtensten, Paula Mazzei and Carlos Dutil, and director of photography Marcelo Durst. Post production was done at Metrovision, Buenos Aires. Sound was mixed at La Casa Post. 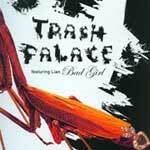 Music is “Bad Girl”, by Trash Palace from the 2002 album, Positions. Trash Palace is the work of French producer Dimitri Tikovoï. This track features the voice of Lian Warrington. Trash Palace Positions at Amazon France. Can you really take all I’m giving? Does that really make me so bad?